1; They've been consistently the best of women's basketball for several years, with all their meetings taking on the feeling of not just a game, but an event. So when they met for the 50th time Friday in the Women's Final Four, we were expecting quite a floor show. It wasn't that for the first half, as both teams struggled offensively. But UConn and Notre Dame usually deliver, and they did in the second half. The Huskies came up with as much as nine in the fourth quarter, but the Irish came back to win 81-76, as UConn's hearts were broken in the national semifinals for the third year in a row. Notre Dame senior Brianna Turner , who had to sit out last season after an ACL injury suffered in the 2017 NCAA tournament, came up huge. She had to watch the Irish championship last year, but she was the front and center of the Irish attack this season. And she had a brilliant game Friday while becoming her school's all-time leading shot-blocker with 371. Check out Tournament Challenge for live updates with a chance to Win $ 5,000 in Amazon.com gift cards! Turner finished with 15 points, 15 rebounds and 5 blocked shots, including a key block late against UConn's Napheesa Collier in the final minute. "My only mindset was that UConn's season had to end tonight, no matter what it took, "Turner said. It did, but the Irish's vaunted offense had come through in the fourth quarter when it looked as though the Huskies had taken control, up nine with 7: 52 left. Notre Dame can score like lightning can strike: suddenly and often. The Irish did that. The Irish went up 76-73 with 58.3 seconds left. 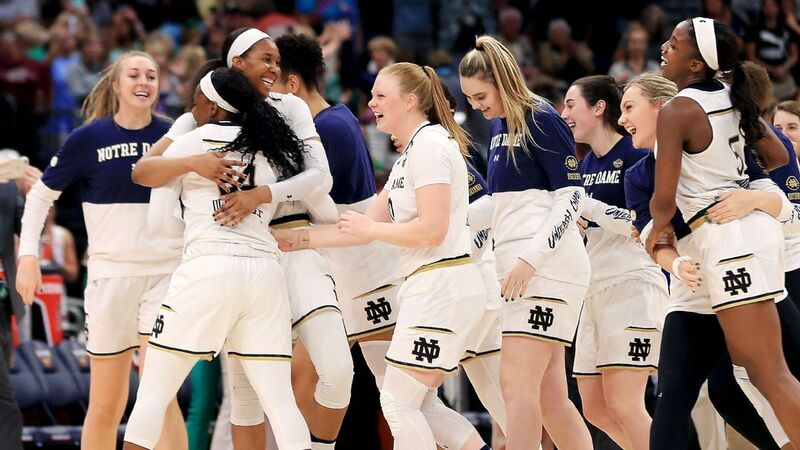 After Collier's shot was blocked by Turner, Arike Ogunbowale – the hero of last year's national championship team – then went to the foul line and made both free throws to put the Irish up 78-73. UConn's Katie Lou Samuelson missed, and Turner got the rebound. Missed one of her foul shots, though, and UConn called timeout with 23 seconds left, down 79-73. Samuelson missed another 3-pointer, and Turner sealed the win with two free throws. "It was frustrating because there were times we were in the wrong defense, and Katie Lou had a great second half," Notre Dame coach Muffet McGraw said. Turner was the key defensively. And the offense came through, with Ogunbowale leading the way with 23 points. Jessica Shepard had 20, Marina Mabrey 12 and Jackie Young 11. Samuelson finished the game with 20 points, all in the second half. Collier had 15 points and 13 rebounds. They finished their careers in the top five all-time at UConn in scoring, but they just won one NCAA title, as freshmen. And Samuelson, who was injured in the 2016 semifinals and couldn't play in the final that year, ends here career without ever getting to play in a national championship game. "Every kid in America wants to be rewarded by going to the Final Four, "UConn coach Geno Auriemma said of Collier and Samuelson. "So for me, it's all about the fact that regardless of how it goes this weekend, these two are their career exactly where it needs to end. I'm really, really, really thankful for that." Behind the post play of Lauren Cox and Kalani Brown, and the kick of unsung hero Chloe Jackson, Baylor has a shot at its third NCAA title. But certainly, especially after being up by nine in the fourth quarter, Auriemma and the Huskies have to be pretty bitterly disappointed. They still lead the all-time series with the Irish 37-13, but Notre Dame is 5-3 against UConn at the Women's Final Four. Neither team shot well in the first quarter. UConn was at 35 percent, and Notre Dame 30 percent. Ogunbowale didn't score in the opening period, after which the Huskies suffered 16-12. The Irish opened the second quarter on a 6-0 run, prompting a timeout from Auriemma. The rest of the quarter was a back-and-forth battle between two normally good offenses that were not playing well. Christyn Williams, who torched Notre Dame for 28 points in the Huskies' 89-71 victory at Notre Dame on Dec. 2, hit a buzzer beater just before halftime, putting UConn up 30-29. Both teams struggled from the field in the first half, with the Huskies at 36.1 percent and the Irish at 35 percent. They were especially cold from behind the arc, going a combined 3-of-25. Samuelson scored UConn's first points of the second half, finishing the third quarter with 15 points including three free throws with 1.0 seconds left. That puts the Huskies up 54-52 into the fourth quarter. But with such a resilient offense and the Turner-led defense, the Irish prevailed again.